These built-in battery motors are designed for long term battery operation, particularly for use with 'in window' solar installations. They have an industry leading ultra-low standby current consumption and typically last for 3 to 6 months on a single charge (daily use) and can be recharged 200 to 300 times. Each RollerTrol™ battery motor has a small hole on the outside edge of the exposed cap at the antenna end of the tubular motor. Inside the hole is a small switch for activating the 'programming' mode of the motor. You will need a small blade screwdriver or similar object to insert into the hole to reach the setting switch. The picture at right is a generic representation, and motor head design will vary slightly from model to model. You can feel a pronounced tactile click when this switch is activated, when inserting a small screwdriver or similar item into the hole. You do not need to apply much pressure for this to be activated. The charging jack is where you would plug in either the optional solar panel or the AC to DC charger. Note that you will risk destroying the battery (and void the warranty) if you use anything other than the units we provide; they have been carefully designed to work with the built-in internal battery and associated circuitry. The LED on the AC charging unit will change color from red to green when the battery is fully charged. When you first receive the motor it will be in a partially charged state that will require topping up. This could take up to 4 hours, although it can be much quicker, depending on the residual charge. Please Note: The AC charger must be removed after the battery is charged, although a solar charger can stay permanently connected. 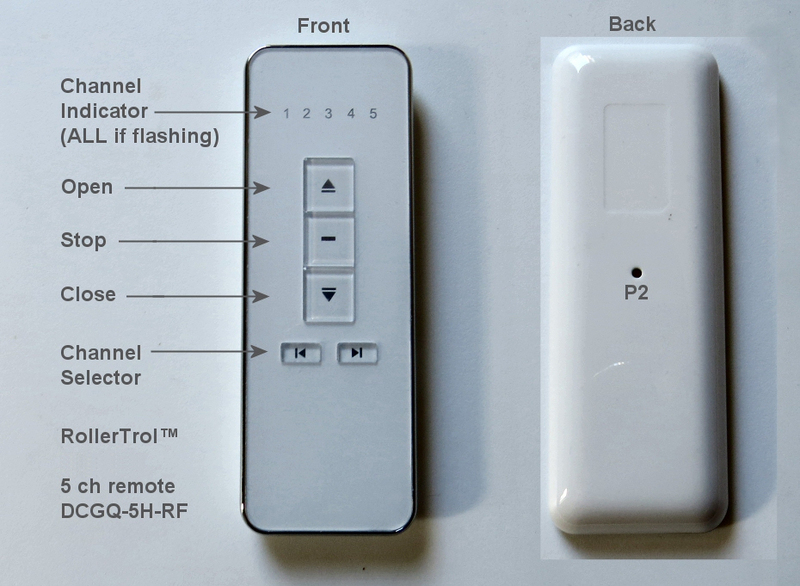 There is a hole in the back of the remote with a button inside it (the cover does not need to be removed; please familiarize yourself with the location of this switch, it is used to confirm channel assignments and other programming actions. It is referred as P2 in the instructions. There are up / stop / down buttons and channel selector buttons as per the above picture. You can slide the back cover off the remote control to replace the battery, but these units come with batteries installed and last for years. A slight downward pressure with your thumbs at the top while you slide it off is all that is required. After removing this cover, you will see the battery compartment at the bottom of the remote. If the button battery is not installed, insert it now. Please pay attention to the battery polarity. The battery has a large plus + sign on one side - this should be facing up, towards you. As a convenience, your shade motors can 'grouped' (cloned) onto a single channel simply by assigning the motor to the same channel. You can also assign the motor to any other channel on any series G remote control, using the following procedure. It is entirely up to you how you do this. Keep in mind that channel zero is automatically programmed as the ALL channel, as you assign motors. Make sure the master REMOTE is set to the master channel you want to clone; the next actions must be completed within 6 seconds of each other. Each motor can store up to 20 different channels in the on-board non-volatile flash memory. 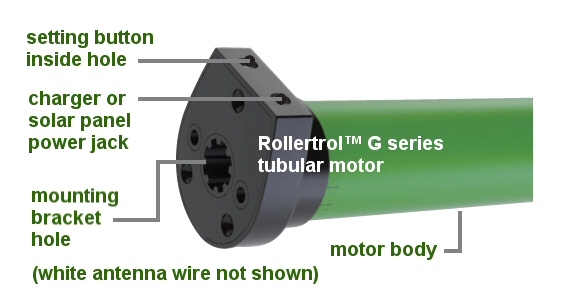 These battery motors have no dependency on grid power, and they will still function in the event of power failure. With the Z-wave interface and Vera™, you can later extend control of your window blind radio motors to any browser on your web enabled devices (PC, phone, tablet, etc). VeraLite is a full blown home automation systems - and one of the most user-friendly.